QPR’s hopes of beating the drop received a major blow as Harry Kane underlined his England credentials with a match-winning brace for Tottenham. The attention of those at both ends of the Premier League were focused on Loftus Road, where the teams involved knew defeat could prove a defining moment in their season. In the end, Kane proved the difference in a tense, entertaining battle, scoring either side of half-time to take his tally to 26 goals in all competitions in front of Roy Hodgson, securing Spurs a 2-1 win which moved them within three points of the top four. Sandro’s late strike meant his former side had to ride out a late storm, but QPR were unable to avoid falling to a seventh defeat in eight league games. Things could have been so different had Charlie Austin found the net with some decent first-half chances and his team-mates defended better for Kane’s opening goal, which came seconds after fans chanted expletives at him. Rio Ferdinand, Nedum Onuoha and Robert Green were all culpable as the 21-year-old was allowed to nod home a free-kick unmarked, while the defence was again found wanting as Kane was all too easily allowed to run through to net. QPR did have several penalty claims of varying strengths before and after Kane’s second and a fine strike from Sandro led to a tense ending, yet Chris Ramsey’s men were unable to avoid a defeat that leaves them three points from safety. The Hoops manager’s side started well enough against the club he spent nine years with as Bobby Zamora saw a powerful header tipped over by Hugo Lloris. It was soon QPR counterpart Green earning the plaudits, denying a glancing header from Kane — the best Spurs could must in a dominant but toothless start. The hosts grew into the match and would have gone ahead in the 19th minute had Lloris not denied Austin from close range and saved Kyle Walker’s blushes after an error. Matt Phillips and Sandro had attempts as the hosts continued to press, with Austin then wriggling free and hitting hit a rasping left-footed strike off the underside of the bar. 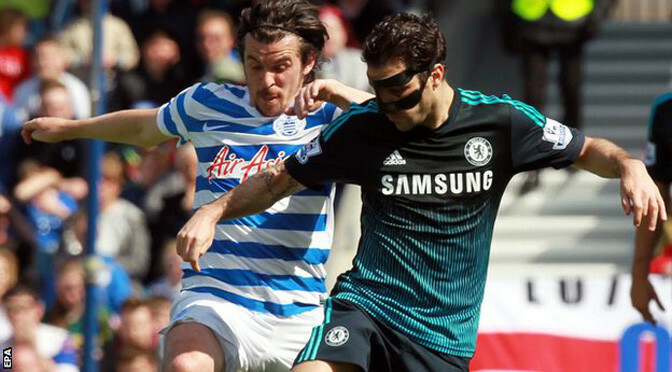 QPR’s best period of the half soon came to an abrupt end, though. Kane was goaded by the home fans after winning a free-kick on the right — chants he shoved down their throats by scoring from the resulting set piece. Andros Townsend’s ball into the box caused havoc, with Onuoha losing Kane after Ferdinand stopped tracking him and Green failing to beat the unmarked front man to the ball. The Rs goalkeeper stopped Spurs from doubling their lead as half-time approached after a Walker effort took a deflection, while at the other end Ramsey’s men felt they should have had a penalty when Lloris appeared to catch Mauricio Isla. Referee Craig Pawson waved play on and both Zamora and Austin had efforts as half-time approached — a period from which Tottenham returned the stronger. Christian Eriksen was not having one of his greatest games but produced a moment of magic two minutes in, with a wonderful, curling right-footed strike coming back off the post from 25 yards. Kane’s attempt to net the rebound went well wide and Townsend was next to threaten the club he spent such a fruitful loan spell with, before QPR at last appeared to wake from their slumber. Zamora used his strength to shake off Eric Dier before thumping a goalbound shot Lloris did well to stop. The striker was aggrieved soon after not to have been given a penalty having been grappled to the ground by Vertonghen, but by that point Austin had produced an incredible goal-line clearance to deny Eriksen at the other end. Tempers frayed with Pochettino entering the field to help break up an altercation between Karl Henry and Ryan Mason, who would soon set-up Spurs’ second. As impressive as his through ball was, it was embarrassingly easy for Kane to get behind the QPR defence, before showing impressive composure to round Green and slot home. Hush fell upon Loftus Road but the volume soon ratcheted up a notch as Sandro fired home from the edge of the box. Austin appealed vociferously for a penalty against Nabil Bentaleb and Junior Hoilett turned over as QPR pushed for a leveller, but it was not to be to the audible frustration of the home fans. 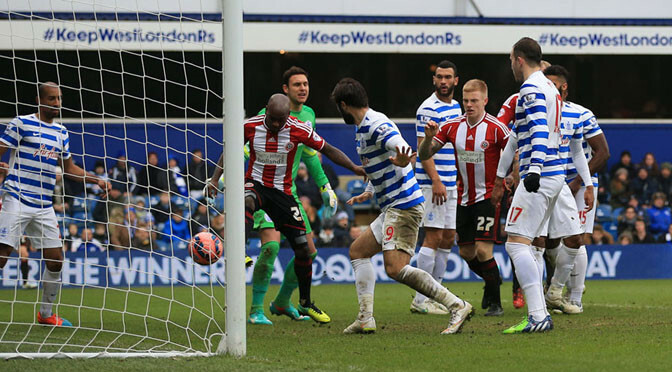 QPR climbed out of the relegation zone as goals from Leroy Fer and Bobby Zamora against Sunderland ended an 11-game losing run away from home. The Hoops took the lead when Fer met Matty Phillips’s excellent right-wing cross with a firm downward header. A fine hooked volley from Bobby Zamora just before half-time sealed a first away win of the season. Sunderland, who have won one of their past eight league games, are only two points above the relegation zone. QPR chairman Tony Fernandes talked before the match of finding his “dream manager”to replace Harry Redknapp, but, on the evidence of this encouraging result, his players are already responding to the interim management of Chris Ramsey. The only sour note for QPR was the loss of Fer, arguably their most influential player, who was carried off on a stretcher with a knee injury 15 minutes from time. Ramsey’s side were undaunted by the absence of injured leading scorer Charlie Austin, who has 13 league goals this season. The visitors dominated the opening exchanges, with Joey Barton firing over and Zamora glancing a header wide, and they took a deserved lead in the 17th minute when Fer nodded home. Sunderland, for whom defeat ended a four-game unbeaten run in all competitions, were denied by a combination of poor build-up play and fine goalkeeping from Rob Green. The former England international pulled off a spectacular save to parry Connor Wickham’s header on to the bar, then scooped the ball clear as it bounced behind him. QPR continued to pose a threat on the break, especially down the right, and it was that route that provided the second goal as another Phillips cross set up Zamora, who finished superbly. Sunderland improved after the break, but a QPR team full of experience – Barton, Karl Henry and Rio Ferdinand all started – nullified the hosts’ threat. The Black Cats still have only two home wins this season, the lowest tally in the top flight. QPR have made contact with Tim Sherwood about becoming the club’s next manager but no deal has yet been agreed. Derby boss Steve McClaren and Real Madrid assistant coach Paul Clement are also in the frame to replace Harry Redknapp, 67, who resigned on Tuesday. QPR chairman Tony Fernandes is keen to bring in a young manager with a focus on nurturing young talent. The club hope to make an appointment next week and at least by the time they play at Hull on 21 February. “We the board will hire someone who cares, thinks long term, wants to be involved in developing the academy, has coaching skills, will play young players and is a winner,” said Fernandes. 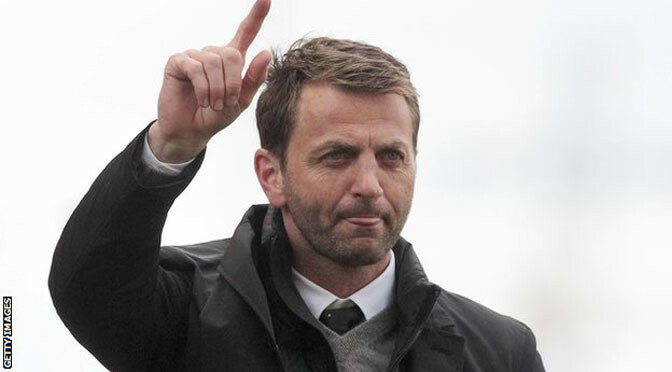 Sherwood, 45, is without a job after parting company with Tottenhamin May 2014 following five months in charge. McClaren is familiar to Fernandes, the former England manager having joined QPR as a coach under Redknapp in July 2013. However, the 53-year-old is trying to steer Derby, who are second in the Championship, to promotion to the Premier League. Clement, 43, has been assistant to manager Carlo Ancelotti at Chelsea, Paris St-Germain and currently at Real Madrid. He also has links to QPR with his father Dave Clement having played for the club in the 1960s and 1970s. 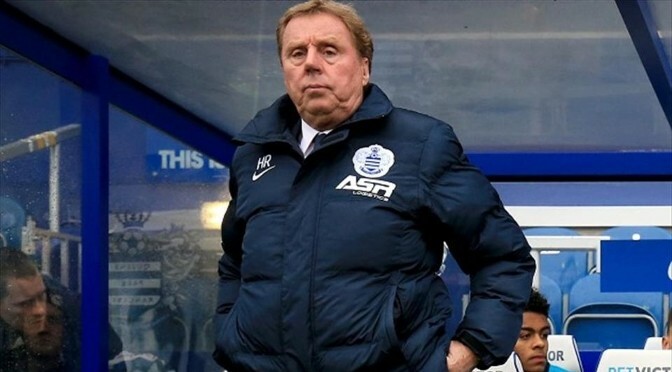 QPR have also confirmed coaches Glenn Hoddle and Joe Jordan have left following the departure of Redknapp. Harry Redknapp has tendered his resignation as Queens Park Rangers manager, the club have announced. Redknapp cited imminent knee surgery for his decision to resign from his post just one day after the close of the transfer window. “I have had such a fantastic time at QPR,” he said. “I would like to thank the board, the players and all my staff, and especially the supporters who have been absolutely fantastic to me since I arrived at the club for their tremendous support. “Sadly I need immediate surgery on my knee which is going to stop me from doing my job in the coming weeks. It means I won’t be able to be out on the training pitch every day, and if I can’t give 100 per cent I feel it’s better for someone else to take over the reins. Redknapp was working hard on deadline day, trying to bring in targets like Matt Jarvis and Emmanuel Adebayor in an effort to drag Rangers out of the prolonged slump that has left them 19th in the Premier League with five wins from 23 games. However, he has now vacated his position – with former Tottenham caretaker Tim Sherwood the odds-on favourite to replace him. Les Ferdinand and Chris Ramsey – both of whom worked with Sherwood at Spurs last season – have been placed in temporary charge of the team. Redknapp was appointed QPR boss in November 2012 but could not prevent the club from being relegated as an expensively-assembled squad failed to gel. He won immediate promotion last season but QPR have struggled again in the top flight, losing every single away game this season to set a new record. Manchester United laboured to a third away league win of the season as they saw off QPR to strengthen the case any potential insider has on ousting manager Harry Redknapp. Marouane Fellaini came off the bench at half-time to score the opening goal of a poor-quality 2-0 win, with fellow substitute James Wilson wrapping things up with his first of the campaign with the last kick. This was just United’s third win away from Old Trafford in the Premier League this season as Louis van Gaal’s expensively-assembled strike-force again flattered to deceive. Having told Radamel Falcao he still needed to prove himself, the Monaco loanee missed the best two chances of the game before Fellaini spared his blushes – moving level with the Colombian on three goals for the season. QPR had their own chances as January player of the month Charlie Austin brought the best out of United goalkeeper David De Gea but Rangers remain 19th in the table and have now gone five league games without a win. His counterpart did not have the most comfortable of afternoons in the away dugout and there were signs of the first grumblings of discontent from United’s travelling contingent as a number implored Van Gaal to ditch his system and change to 4-4-2. The introduction of Wilson on 57 minutes allowed the Dutchman to alter to a 4-4-2 with a diamond in midfield and, less than a minute later, Fellaini hammered them in front – and Van Gaal’s name was once again being toasted by his fans – with Wilson adding the gloss deep into stoppage time. Before that, everyone at Loftus Road had witnessed a first half was bereft of quality as both sides wasted possession and struggled to sustain any periods of sustained pressure. Juan Mata, usually so assured on the ball, misplaced a pass to Bobby Zamora – who attempted an audacious effort to lift the ball over De Gea but could not hit the target. Falcao had a golden opportunity to break the deadlock was played in by Mata and found himself free inside the area but shot straight at Robert Green before seeing his more difficult follow-up also kept out by the QPR goalkeeper. If Falcao is low on confidence, his opposite number is at the other end of the scale and Austin had two great efforts in his attempt to put Redknapp’s side in front. His first chance came after Zamora had robbed Jonny Evans of the ball in the channel and fed in Austin, who shot was well saved by De Gea. And the in-form Spain goalkeeper was on hand to again frustrate Austin, tipping over a sweetly-struck half-volley on the 30-minute mark. 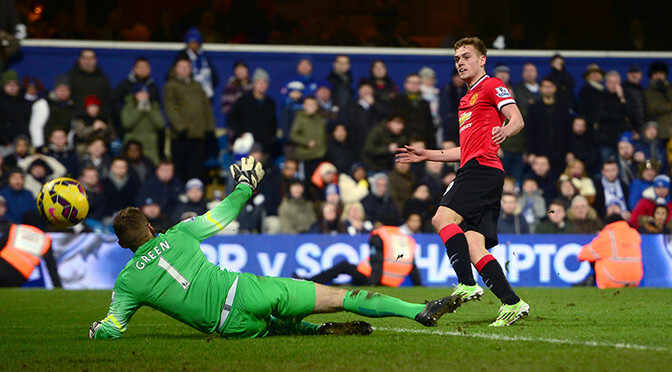 Mata was withdrawn at the interval as Van Gaal as Fellaini replaced his more diminutive team-mate, while QPR were also forced into a change as Steven Caulker replaced Dunne at the back. The second half started in much the same way and Leroy Fer was guilty of missing the best chance since the interval as he headed a Joey Barton free-kick wide when under little pressure. Falcao came the close to breaking the deadlock as he peeled off the QPR defence to meet Antonio Valencia’s deep cross but again Green was equal to his header. But United did take the lead moments later as Rooney picked out Valencia, whose loose ball into the box was controlled by Fellaini before the Belgian lashed home. Redknapp’s men tried to react immediately but Fer struck a shot over De Gea’s crossbar before Michael Carrick and the returning Marcos Rojo took each other out of the game going for the same ball – with QPR breaking forward en masse, but United’s often questioned defence stood firm. United broke forward and Wilson’s cross looked destined to be tucked away by Falcao, only for Caulker to get a despairing touch on the ball and divert it clear of the waiting forward. The same combination failed to double the Red Devils’ advantage moments later, this time Falcao throwing himself at the young forward’s cross but unable to connect. QPR rallied at the death but Eduardo Vargas could not beat De Gea at his near post as United made sure of the win when Wilson finished at the second attempt, having been played in by Di Maria. Jamal Campbell-Ryce scored twice as Sheffield United humiliated QPR, knocking out the Premier League side and storming into the fourth round of the FA Cup. Marc McNulty slotted in a 36th-minute opener for the League One side after being put through by Louis Reed’s pass, and Campbell-Ryce netted early in the second half after keeper Alex McCarthy was unable to claim Reed’s corner. Campbell-Ryce struck again in the final seconds when he gratefully collected Leroy Fer’s wayward back-header and skipped past McCarthy to cap a brilliant Blades victory. The result continued United’s remarkable recent cup record. Nigel Clough’s men reached the FA Cup semi-finals last season, beating top-flight Aston Villa and Fulham along the way, and have knocked Southampton and West Ham out of the this term’s Capital One Cup. QPR, meanwhile, have suffered numerous early exits, several against lower-division opposition, in the 18 years since they last made it past the FA Cup third round without needing a replay. The west London outfit have won only two cup ties in the last 11 years. Rangers boss Harry Redknapp made seven changes to his starting line-up but nevertheless named an experienced side which included the likes of Rio Ferdinand, Fer and top scorer Charlie Austin. They made a decent start, with Fer seeing a stinging shot saved at the near post by keeper Mark Howard, who also kept out an effort from Jordon Mutch. But the R’s never looked comfortable at the back and Campbell-Ryce gave the hapless Armand Traore the runaround on the right flank. Stefan Scougall was also a constant threat for the visitors and fired over before they eventually went ahead nine minutes before half-time courtesy of McNulty’s ninth goal of the season. Redknapp sent Bobby Zamora on at half-time in an effort to change the course of the game, but United were two ahead within four minutes of the restart. Traore needlessly conceded the corner, and McCarthy, in for the rested Rob Green, got nowhere near Reed’s right-wing delivery. After the ball bounced off Mutch, Campbell-Ryce had the simple task of scoring from close range. Zamora squandered a golden opportunity to quickly pull a goal back when he headed Matt Phillips’ cross wide of the target. Phillips was also guilty of a glaring miss, slicing a shot high and wide from inside the box following a surging run by Mauricio Isla. Rangers, whose electrifying performances at Loftus Road have given them a fighting chance of avoiding relegation, were listless throughout. Fer’s stoppage-time error in the build-up to the third goal summed up their display and they were booed off by the home fans at the final whistle. Swansea City midfielder Wayne Routledge has won his appeal against a red card he received in the 1-1 draw at Queens Park Rangers on New Year’s Day. The 29-year-old was dismissed four minutes from time for his reaction to a challenge by Karl Henry that went unpunished by referee Anthony Taylor. Swans boss Gary Monk had described Henry’s challenge as a “leg-breaker”. Routledge is now available to face Tranmere Rovers in the FA Cup third round on Saturday. An FA statement said: “Following an Independent Regulatory Commission hearing on Friday, 2 January 2015, Swansea City’s Wayne Routledge has had his claim for wrongful dismissal upheld. Despite being reduced to 10 men, Swansea substitute Wilfried Bony went on to score an equaliser in time added on, cancelling out Leroy Fer’s first-half strike. Substitute Wilfried Bony’s injury-time goal rescued a point for 10-man Swansea to deny Queens Park Rangers. QPR goalkeeper Rob Green escaped a red card early on when he handled outside the area to deny Wayne Routledge. Leroy Fer then put the Rs ahead with a fine long-range strike after Federico Fernandez had only half cleared. Routledge was red carded for reacting to a Karl Henry tackle before Ivorian Bony had the final say in his last game before the Africa Nations Cup. While QPR have now claimed 15 points from their last seven home matches – a record which lies in stark contrast to their away form which has seen them fail to pick up a single point on the road this season – the outcome will be viewed as an opportunity missed by manager Harry Redknapp. The gap between them and the relegation zone stands at two points. Having lost at Liverpool on Monday, this was a welcome point for Garry Monk’s Swansea in their bid to qualify for Europe. They had lacked a cutting edge in attack until the introduction of Bony from the bench in the second half. But they could easily have played the majority of the contest against 10 men after the onrushing Green escaped punishment from referee Anthony Taylor in the sixth minute despite clearly denying Routledge outside the area with an outstretched arm as the winger attempted to round him following Gylfi Sigurdsson’s measured pass. It had looked set to be a pivotal moment when Netherlands midfielder Fer scored with a powerful shot inside the left post from the edge of the area after Fernandez had failed to deal with Clint Hill’s deep cross. Rangers had opportunities to double their advantage with Bobby Zamora heading over the bar from close range, while Charlie Austin nodded against the foot of the left-hand post early in the second half from Mauricio Isla’s cross. The momentum appeared to swing further in the home side’s favour when Routledge was dismissed rather harshly after reacting angrily to a feisty Henry tackle. But Swansea kept fighting and Bony once again demonstrated his predatory instincts when, after receiving Ki Sung-yueng’s pass, he turned sharply before finishing into the top-left corner. Austin could have won it in the final seconds when the ball fell to him inside the six-yard box, however he blazed over the crossbar.